Nourishes the spirit, promotes alertness and a healthy attitude. Relaxes you and soothes tensions when experiencing fatigue. Energizes you both mentally and physically so that you can better perform your daily activities as you age. Do not take this product if the appearance has changed or it develops an off odor. If you are pregnant, take this product only in accordance with the advice of a physician. Do not take with caffeine or other stimulants, in excess of the recommended amount, or if you are allergic to the ingredients in this product. If you have a history of allergies take this product with care. Not recommended if you have diarrhea, loose stools, abdominal fullness, the common cold or fever. 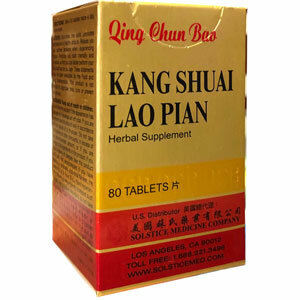 If you have hypertension, diabetes, or other chronic diseases such as heart, liver, or kidney disorders, do not take this product without consulting a physician. If you are taking any over-the-counter or prescription medication consult a physician prior to use. This product is not to be used as a substitute for medicine. Avoid pungent, oily, raw and cold foods when using this product. Store tightly sealed in a cool, dry place.